Learn to get lost. Surrender to coincidence. Be undercover and follow somebody else’s footsteps. And draw (design) a new poetic survey of Prague through the colors of everyday clothes. Carly Everaert asks the audience to participate in her research and allows the public to roam the city streets on the basis of a method inspired by the Situationists. You follow someone through the city because of what they are wearing, for example a red skirt. You continue to follow the person in question until you encounter someone else wearing a red skirt. At the end of your journey, not knowing where that will be, you are invited to take a fresh look at the city and its people as if they were theatre. “Surfing” is an important strategy in Carly’s practice as costume designer. In Prague she tests the value of this strategy in public space. And draw (design) (with me) a new poetic survey of Prague through the colors of everyday clothes. 1. Chose a colour you want to follow in the (inner) city. This colour should be worn by a person. Say you want to follow the colour red. You chose for example a person in a red jacket. 2. Start you’re my tracks app so it will trace your footsteps. 3. 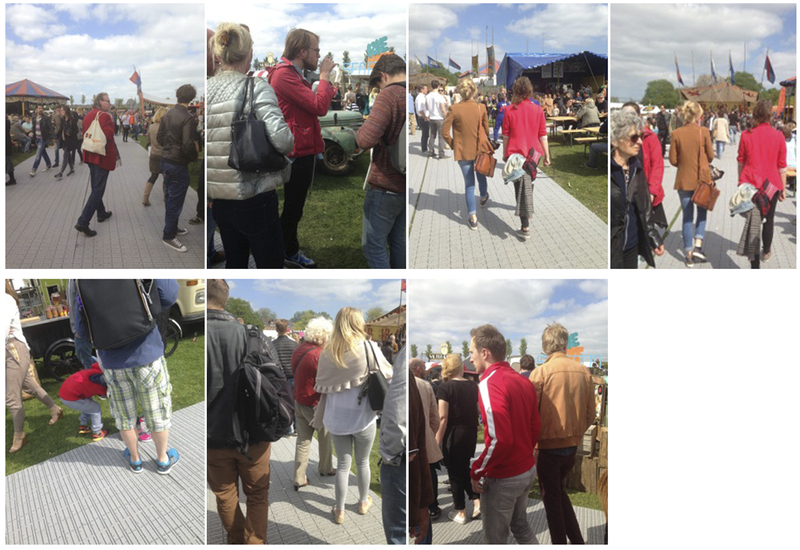 As soon as the person you are following passes another person in a red jacket, you start to follow that person. When the sixth person crosses the seventh person you are at your final destination. 4. Stop, save your track and make a screenshot. 5. Take a picture of your final destination. This is the “set”. 6. Open your envelope and read the letter. Please answer the letter. 8. Your picture and response might become part of the Dutch exhibition that explores public space from the perspective of scenography. Check our research page on this website to see if your picture made it to the exhibition. Thank you so much for surfing with us!